The facts behind today’s Daily Record story will come as no surprise to the readers of this blog. It will come as even less of a surprise to the blog participants whose sterling work uncovered the Companies House filings and refined the analysis on which today’s story is based. In the local vernacular, “chapeaux” to all concerned, but especially to: Don Dionisio; JohnBhoy; PaulieWalnuts; Onandonandon; and so many others. (I feel like an Oscar winner who has left out the names of several key people in an acceptance speech. Forgive me for the many omissions, but we will find a way to recognise other outstanding contributors in another post). Many will still be trying to figure out what is going on at the Daily Record let alone Rangers. After years of sycophancy, it seems a remarkable turn of events to see Keith Jackson and James Traynor bite the hand that once fed so much. The motivations behind this sudden turn of events piqued my curiosity. After a few calls to some well placed sources, the pieces of the jigsaw started to fall into place. This morning’s Daily Record story represents the opening artillery barrage in the Battle for Rangers’ Soul. As we have been hinting at in recent weeks, there was never a guarantee that Craig Whyte would have the field unopposed to rebuild Rangers. Following receivership (which in this case would mean certain liquidation), Craig Whyte’s newco-Rangers would have no more legal claim to be the successor to the club formed in 1872 than if I formed one. It is with this in mind that Rangerstaxcase.com can ‘exclusively reveal‘ (sarcasm intended) that current and former Rangers directors, Dave King and Paul Murray, are planning to force Craig Whyte out of the picture. By exposing Whyte’s reckless financial strategy, they hope drive a wedge between Whyte and the club’s supporters. With bankruptcy in some form now looking inevitable, the path will be open for King and Murray to claim the mantle of legitimacy as the inheritors of Rangers’ traditions and fan base. A season ticket renewal boycott will likely play a role in forcing Whyte from the field of play as will continued revelations and insinuations of incompetence and unfitness to be Rangers’ custodian. King faces hurdles related to his public involvement in this plan. His current directorship is a legacy of his financial investment made before his own tax troubles in South Africa exploded. As a direct result of this dispute, he is subject to court orders in Scotland and England preventing him from buying or selling any assets. The court orders also prohibit anyone from buying or selling assets on his behalf. However, it is widely believed that he has accumulated substantial personal wealth offshore and would have the means to support a relaunched club if legal obstacles could be overcome. Unimpeded by any such restrictions, Paul Murray is not believed to have the personal wealth required to launch Rangers on his own. Therefore, the alliance with Dave King is a natural one. However, if King cannot resolve his issues with the South African tax authorities (SARS) soon, suspicion may fall once more over any relaunch of the famous Glasgow team. After a decade in which playing in the shadows of the law has brought Rangers to the brink of disaster, any newco that is not seen to be above reproach in terms of its sources of funding would continue to fuel the curiosity of bloggers and investigators. However, with the backing of the Scottish media, King and Murray can expect an easy ride. The Daily Record has clearly made a decision as to where its own economic interests lie. If Whyte is not going to be able to supply enough positive transfer stories to boost circulation, then regime change will get their unquestioning support. Those who might have hoped that today’s Daily Record might have signaled a new period of responsible and open journalism in Scotland will be disappointed. It is more simply put that Traynor and Jackson are just backing a different horse. The proposed move of Nikica Jelavic from Rangers to Everton has predictably stirred much debate. Much of the chatter has focused on what the receipt of fresh cash would mean for Rangers FC. As we told you three months ago, Rangers cannot get to the end of the current season on their own cash-flow. Without some combination of external capital investment from owner Craig Whyte, selling assets, or dramatic cost-cutting, Rangers would have faced- based upon the budget in place in August- certain bankruptcy before the season’s end. Companies in dire financial straits stop paying their bills until forced to do so. Craig Whyte’s Rangers have seen more court than Andy Murray in recent months. It seems likely that had Rangers paid their bills on time and kept current with PAYE, National Insurance, and VAT that the club would have already folded. Depending upon your perspective, Craig Whyte is to be applauded for ducking and diving to prolong Rangers’ life or he is to be pilloried for avoiding the legitimate consequences of insolvency- technical and actual. Only Craig Whyte will know for sure whether he had access to sufficient funds to pay the club’s bills as they fell due (and has simply chosen to not do so). The Jelavic transfer (if actually concluded) is a form of liquidation in place. They are digesting themselves for sustenance. Rangers will convert an intangible asset to cash. They will probably get to meet their next payroll without needing to bring in more of Whyte’s own cash. We do not know how much of the £6.7 million Craig Whyte promised to invest in Rangers has actually been delivered. However, we do know from the unaudited accounts released that it was not delivered by 30 June 2011. (For any sports hacks reading, get an accountant to explain it to you). It is understood that Whyte has been bringing in some cash to meet recent pay requirements, but since information security has tightened recently at Ibrox, we have not been able to get detailed reports on how much. There has been a lot of speculation over how much of any transfer fee Rangers will see. My only source on this is from documentation prepared for Whyte in late May 2011, just after the takeover. This excerpt seems to indicate that from the original £4 million transfer fee, that €2.4 million ( £2 million) remained to be paid at the end of May 2011. Since that time, we have heard reports that Rapid Vienna had been threatening legal action to get Rangers to make good on a milestone payment. So it looks like the ‘ring-fencing’ of these funds did not actually take place under Whyte. Reports in the Austrian press back in early November claimed that Rangers had fallen behind on a stage payment of €500k. We have no information on how many such payments were paid between May 2011 and now, but it is possible that Rangers still owe Rapid Vienna as much as £1.4 million from the deal. Furthermore, without access to the transfer contract, we do not know if any outstanding amounts must be repaid immediately on the player being re-sold or whether Rangers can take the £3.5 million now and stick to the original payment schedule. There has also been chatter about Rapid Vienna’s claims over sell on fees. It would be a surprise if Martin Bain (a very experienced football negotiator) had agreed to anything other than the Austrian club receiving a percentage of profits. If Jelavic is sold for £3.5 million, Rapid Vienna would not see any additional fees. Given Rangers’ reluctance to pay bills without fuss, it seems reasonable to assume that there were no additional payments to Rapid. If this is the case, Rangers’ net haul from the deal could be as low as £1.9 million. Although, if Rapid’s share can be delayed per the original payment schedule, Rangers might be able to use all of it as working capital prior to a result from the tribunal. In this case, Rapid would join the queue of unsecured creditors who will get stiffed should the tax case go “as well as expected”. In summary, Rangers’ inexperienced management team botched the marketing of their star player in the summer (and will have infuriated creditors awaiting on payment last summer with stories of rejecting fabulous offers). That Rangers’ title hopes are being dented for such a relatively small amount should ring the alarm bells of reality for any of Rangers’ supporters who still believe that all is well at their club. Is it enough to get Rangers’ through to season ticket renewals? That depends on how much in the way of external funds Mr. Whyte can access. It appears that I have hurt Darrell King’s feelings. 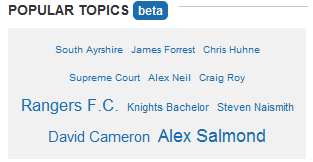 He took a few swipes at this blog last night on Radio Clyde’s Superscoreboard programme. We should not be too surprised for I have been less than complimentary about him. All is fair in love and war after all. (For the record, I do think that he is the best of a very bad bunch). Having played a part in exposing the incompetence of the Scottish sports media pack, a counter-reaction against us is only natural. In particular, Darrell will be irked that I keep referring to his claim, made on live radio, that Rangers players held side-letters demonstrating that the “loans” from the EBT never need to be repaid. This will, if true ;-), prove to be the smoking gun in this case. (Well there “might be” a few more interesting pieces of information that Darrell has not told you about). Why would someone with such easy access to the facts get the interpretation so wildly wrong every time? It could not be just a cynical ploy, could it? To be seen publicly defending Rangers’ position, but privately understanding what has really happened? Perish the thought! It would suit the likes of Darrell for this blog to become distracted from our mission to roll around in the mud. So, I will reply today and move on. However, we can expect more of these slaps as the facts of the case are revealed. We shall let the blog speak for itself in future. For a journalist, Darrell seems to have a very short memory and must not be taking notes. Last night, he described as “complete and utter nonsense” the accusation that he sat on the tax story in April 2010 in order to avoid interfering with Rangers’ title run-in. Perhaps Darrell will recall the following quote: “Untangling Rangers’ finances and breaking them down into layman’s terms for those who matter most – the club’s supporters – is not a straightforward task and much of the information this paper has obtained in the last two days was, understandably, retained until such times as the league championship was won as it was felt it would not serve any good to further muddy the waters when the team was on the cusp of the title”. 27 April 2010, Evening Times- two days after Rangers secured the Scottish Premier League championship. Darrell might want to tell us who wrote this “complete and utter nonsense“? Of course, like several articles that Darrell would not want us recalling, the story is no longer available outside the Evening Times’ pay wall. Thankfully, google remembers lots of things. This text appeared under the heading: “Poison pill that killed the party – Evening Times | Sport | Editor’s Picks”. Who was the sports editor at this paper at the time? In another article ON THE SAME DAY, 27 April 2010, Darrell tells us “For the past few months, sources have spoken privately to this paper about the fears of what was coming“. Two days? A few months? I have no way of knowing which version is the truth. When a sports journalist is willing to sit on the greatest story in the history of Scottish football for fear of upsetting a team’s momentum to the title, we know exactly where we stand and what to expect. To his credit, Darrell does not hide behind a fake love of St. Mirren or Airdrie, His colours are well and truly pinned to the mast. We can expect him to go down with this ship- defiantly inaccurate in almost his every utterance about the tax case since reviving his interest in the subject a few months ago. (His stories in April 2010 were actually very good. It was a rare example of decent journalism. The reaction to that work among his base must have stung him). Rather than running down rabbit holes with those who have been demonstrated to be clueless in the unfolding of Rangers’ tax case, it should be easy to compare the work of this blog- my own and the fantastic work performed by readers- with that of the Scottish media. There is little similarity between our research & analysis and the lamb-fueled output of any one of the ‘professional’ organisations. If anyone is in any doubt as to what drives business for Darrell’s papers, I noticed last night that there is a dynamic graphic at the foot of The Herald’s website. It displays intensity of interest in topics by the size of the text. While hardly a scientific or fool-proof tool, I suspect that it represents the relative interest in Rangers quite well. As dawn breaks over Edinburgh this morning, The Rangers Football Club plc, will see its last sunrise in a world where it can influence its own fate. By this evening, the future of the famous football club shall lie in the hands of three tribunal judges. If this case finally concludes today (as I believe, and hope, it will), the clock will start ticking down to the decision that will see Rangers released victorious to thrive again or suffocated by an unpayable debt. The waiting time for the outcome shall depend upon how much work the judges have prepared in advance of the final days’ summations. If they have written up their findings of fact in advance of this week, a decision might come within a matter of a few weeks. (Following tribunal process, both sides have presented their versions of the facts of the case in previous sessions). Much more likely, given the volume of evidence presented, is that Rangers’ fate will not be known until late March or early April. In fact, there is no deadline on when a result must be published. A few exceptional decisions have taken over a year to be released. As the Scottish media and Rangers’ own supporters slowly wake up to the danger, it is worth revisiting the efforts expended to deflect and deny that this story was even true. Following fast on the heels of an April 2010 News of The World (RIP) story that HMRC were planning an attack on “Scottish football clubs”, Darrell King of The Herald and Evening Times published details (delayed to avoid possibly derailing league victory) that Rangers were the specific club being targeted. Despite getting the basic facts correct, King’s newspapers were forced into humiliating retractions. With his wings clipped, he avoiding discussing the subject until very recently. Rangers’ Chairman at the time, Alastair Johnston, cunningly misled fans and shareholders in media releases and at Rangers’ AGM in 2010. While his statements were not inaccurate in the strictest sense, they were designed to give the impression that the tax issue was a matter for the club’s parent company and that “‘I do not think it should be a material concern for us“. The subject was then dropped. For Scotland’s famously craven and incompetent sports hacks, it was business as usual. They reprinted PR-firm lies in return for access to transfer trivia. Any attempt to discuss the tax case in public fora was met with either derision or “may I remind you that we are a live broadcast“. If there is a legal barrier to commentary, it seems to apply only in Govan- as the media’s frequent flaying of Hearts’ owner continues to demonstrate. The most important story in the history of Scottish football was ignored and left to die. For the general public, the attitude to the tax case could be summed up as: “If there was any truth in this story, the newspapers would be all over it“. The inspiration to start this blog was my incredulity at the degree to which the Scottish media had been co-opted. Sitting quietly in possession of the truth about what was happening, I could not believe that this story had not found a single champion inside the reporting establishment. At least fifty people, in seven or eight organisations, knew what I knew. In a city where the faintest whiff of a story involving either Rangers or Celtic is relayed like a shock-wave, that no one was talking seemed remarkable. Then I realised why- no one trusted the hacks. The people with access to the facts of this story are no mugs. We all understood the tight-knit corrupt ‘clubbyness’ of those within the sports media-Rangers axis. Promises of confidentiality would be breached for a glass of burgundy and a plate of succulent lamb. Gossip traded over too many whiskies could ruin your career. No one in their right mind would talk to an establishment reporter for fear of being burned in return for an “exclusive” on which foreign superstar was being tracked by the Ibrox club. (Darrell King was fed his story in April 2010 by Rangers’ director Dave King who was trying to launch his own bid to buy the club, coincidentally enough, for £18m for the debt + £1 for the shares. So it hardly counts as socking a blow against ‘The Man’). When any facet of society is able to conduct its business beyond public questioning corruption follows. The sloth of the sporting wing of the journalism profession in Scotland has played a large role in bringing our national game to this point. In the next 12 months, it is more likely than not that two of the three largest clubs in the country will file for insolvency. As a Celtic supporter, I fall prey to the occasional bout of Schadenfreude over Rangers’ misfortunes. It is the very essence of the rivalry between supporters of these clubs: no quarter asked, none given. One of the best aspects of this blog is the way in which articulate and reasonable fans from both sides (and even a few others) can have an online discussion that does not degenerate into sectarian bile hurling. However, my contempt for what passes for a sports journalist in Scotland today has grown to the point where Rangers are almost a side-issue. Ill-informed, arrogant, and lazy, they have failed to do their jobs. I doubt that any of them dreamt of copying-and-pasting transparent lies for corporate interests when they made their career choice. However, they sold their souls for an easy life. For them, no worrying about cultivating contacts or having to have an original thought. I wonder how they face the mirror in the morning. We will find out Rangers’ fate soon enough. If, as I expect, the tribunal finds heavily against Rangers, the inquest and recriminations shall begin. It is unlikely that much blame will find its way to the right places. Already the media pack are working hard to narrow down the options for remedy: the only game in town appears to be that a newco-Rangers must be allowed immediate and free entry to the Scottish Premier League. Scotland’s football journalists will brook no discussion about anything that threatens their gravy-train. Tax Deal “Rumour”: What was the point? Scotland’s sports journalists have surpassed themselves recently. Even by their own fathomless standards for getting it wrong, the release of the summary minutes of the Rangers Supporters Assembly (RSA) meeting with Craig Whyte could not have done more illustrate the scale of the credibility problem facing the mainstream sports media in this country. Mark Guidi’s regular slot on Radio Clyde’s Superscoreboard has given him a platform to embarrass himself repeatedly. On 27 December, Mr. Guidi told us that there was “a groundswell that the tax case will be sorted out before the case resumes”. Just this week, he used this pulpit to tell us all that HMRC will be happy to accept a greatly reduced figure (£5-6 million) from Rangers. According to Guidi, HMRC has only won 5% of similar cases. (This is not only wrong, it does not even make any sense. Rangers’ case is quite unique in several ways). His colleagues have made many similar misstatements. When a caller (Terry) informed him that these stories were nonsense (citing this blog as his source), Guidi denied any knowledge of our existence let alone having ever read our content. However, the caller was correct. Guidi was talking nonsense. Of course, there is no need to take my word for it. Who better than Craig Whyte and the RSA to clear up the confusion: “No scope for negotiating a settlement with HMRC due to the criticism they have had from MPs and the Media about some high-profile ‘deals’“. If someone can see fit to forward a link to our site to Guidi, it might be a good place for him to start doing research before he makes things worse. Guidi and several other Scottish sport journalists have been pumping up the hopes of Rangers fans with these tales of a deal being imminent for several weeks. The question is: why? We know already that Rangers’ PR firm, Media House (ran by Jack Irvine), have been spreading the optimisic ‘deal about to be done’ story around every newsroom in the country. That does not answer the question as to why a journalist would believe any PR-rep’s stories about Rangers. If they told me that Ibrox was in the G51 postcode, I would have to walk there and look- such has been the trail of lies and disinformation since Whyte’s name was first linked with the club. Were they promised upcoming transfer exclusives? Perhaps. More to the point, why did Media House hype this story only to be contradicted by Whyte himself within a matter of weeks? I hope that Jack is working cheaply because this looks like it was a complete waste of time and money. Sources within Ibrox have described the daily operations since the takeover as ‘shambolic’. It certainly seems that way from the outside. Mr. Whyte also confirmed HMRC’s powers to demand payment if/when the First Tier Tribunal (FTT) finds against them. We have made this point several times (including the previous blog entry): should the assessments of tax liability in Rangers’ possession be confirmed, the bill becomes due and payable immediately. Even if Rangers appeal the findings, HMRC has the right to demand payment without further delay. (If Rangers won their appeal, they would be entitled to full repayment plus interest, but that is academic as they would have already become insolvent). If an appeal is seen to be reasonable i.e. where it is obvious that there is some ambiguity in the law or that the employer drifted over the line into illegality rather than raced across it, the taxman will not usually press for payment when doing so would cause insolvency. However, where the appeal is vexatious (i.e. no real chance of winning it- just being done as a heel-dragging exercise), then HMRC would be justified in taking a tougher line. It may not help their case that Rangers have launched an appeal for the £2.8 million that was taken (most of it forcibly- after a court order) for the Discounted Options Scheme (“The Wee Case”). After months of correspondence over The Wee Case where the admission of liability was clear, if Rangers’ appeal is viewed as being without a reasonable legal basis, HMRC might take a more dim view of an appeal relating to The Big Case. Craig Whyte has made clear, in his own words and in the takeover contract documents, that he believes that his position in the event of insolvency is protected through the £18 million debt owed to him by Rangers and the floating charge over the club’s assets. It is very obvious that Rangers FC have no intention of paying anything close to the full amount of tax, interest, and penalties that have been assessed. The implicit threat is “we will go under and HMRC will get nothing” . If this case was only about immediate revenue collection then HMRC should offer Rangers a deal. However, it would lay down a marker for every business owner, inside and outside of football, that one can engage in a shockingly blatant tax scam and have little to fear. If Rangers can negotiate a pennies on the pound deal now, it signals to every under-pressure company director that corners can be cut. Even if rumbled, the worst he or she would have to deal with would be repaying 10-20%- and even that would be a decade later. Sounds like a pretty tempting deal! HMRC’s credibility, and a just outcome for this case, require that life is not made easy for those whose plans rely upon ducking their social and financial responsibilities. This blog has been accused of wishing malice on Rangers FC. This is not true. I am not one who seeks the extinction of Rangers in the style of Third Lanark. What I seek is a fair outcome- nothing more and nothing less. ‘Fair’ in this case would be any resolution that sees Rangers carry a millstone of sufficient weight, and for an appropriate duration, that counter-balances the benefits accrued from their use of the EBT scam. Since its implementation in 2000, Rangers have won the Scottish Premier League five times. The present day value of the £24 million in tax that was saved along the way is about £36 million. Without the benefit of this £36 million, Rangers’ would have have gone bankrupt years ago or would have been forced into draconian budget cuts. They got to stay at the roulette table eleven years after their own money had ran out. Only the most blind or willfully ignorant could fail to see the issue of financial doping in tainting the Scottish championship during this time. If Rangers succeed in ducking any meaningful financial restitution by exploiting kinks in bankruptcy law, then it will fall to the Scottish footballing authorities (SFA/SPL) to ensure that justice is done. A 10-point penalty will be automatic if an insolvency process overlaps with any active football season, but a “newco” club must not be given a free entry into the Scottish Premier League to take the place of Rangers. Scottish football administrators must find the balance between penalising Rangers so heavily that a new club carrying Rangers’ legacy never gets off the ground versus incurring the problems of ‘moral hazard’ by failing to extract a punishment. If football becomes like the banking industry, where wrong-doing and excessive risk taking carries no penalty, we will just continue to get more of it. The task of finding the right balance will not be easy, but I would suggest that a formula based on Rangers (2012) FC starting each new season for a number of years with a points deficit would be along the right lines.